The Council's vision for a state-of-the art leisure centre, a new school and hundreds of new homes near Shoreditch Park. The new buildings will be placed on the site of the existing Britannia Leisure Centre, the existing asphalt tennis courts and the site of the Hoxton Press show rooms. It's hoped that construction will start on the leisure centre and school in spring 2019 and complete 2021. The old leisure centre will not close until the new one is open. Construction of the 81 new homes for Council social rent and shared ownership is due to start in 2020. It's hoped they will be ready by summer 2022. A detailed planning application for the homes for private sale, to help pay for the leisure centre, school and affordable homes in the absence of government funding, is expected to be submitted in 2020. This page explains in detail a range of different elements of the project. It is split into various sections listed below, each of which contain associated FAQs. Click on the links to be taken to that section. Many include more images of the proposed elements. Section 1 - What stage is the project at? The Council's planning application was approved by the GLA on 26 November 2018. Hackney's Local Planning Authority had approved the scheme on 7 November 2018. It is hoped that construction will start on the leisure centre and school in early 2019 and complete in 2021. You can see the application through Planning Explorer. Type '2018/0926' into the 'Application Number' box and click search. On the following page, click '2018/0926' in the 'Application Number' column and you will be taken to the Britannia site application page. What planning permission did you apply for? This application is for outline planning permission for the masterplan of the site. It focuses on the 'first phase' of the masterplan, and includes full details of the new school, leisure centre and residential blocks at the corner of Penn Street and Bridport Place (H1 and H2), which contain the affordable housing element and the first 12 private units. These residential blocks will be 16 and 5 storeys high. It also includes various improvements to the 'public realm', such as the associated roads, pathways, a new public square and entrance to the park, enhanced environmental features around the park edges, and tree planting to make the area more biodiverse and green. The 'second phase', which will include a more detailed application regarding up to 388 homes for outright sale to subsidise the development (H3 to H6), will be submitted at a later date. The Council has chosen to phase the project like this because it wants to prioritise the elements with the greatest social benefit. The full technical details of the first phase are available in the various planning documents. Type '2018/0926' into the 'Application Number' box and click search. On the following page, click '2018/0926' in the 'Application Number' column and you will be taken to the Britannia site application page. Here you can select the various planning documents and have your say via the 'Add Comments Here' link. The illustrative scheme submitted for residential buildings H3 to H6 (those to the north and west of the new leisure centre, along Grange Street) is defined in terms of a number of key features, including the maximum heights of each building, their plot and floor areas, the number of private for-sale units, and construction tolerances. The illustrative scheme presented with this outline planning submission shows blocks of 4, 10, 25 and 19 storeys. The detailed design of these residential buildings (including the unit mix and ground floor retail and affordable workspace uses) will be the subject of a further reserved matters application, in which we will set out the detailed designs and materials for each building. In order to maintain some flexibility during detailed design development, this submission allows for one additional storey to be added to building H6 (to a total of 20 storeys), and the potential to add basements to buildings H3 to H6. These 'maximum parameters', as they are known, have been tested as part of the Environmental Impact Assessment submitted with this outline application. This design flexibility does not change the maximum number of private for sale units (and floor area) which can be delivered across the scheme, i.e. if an additional storey was added to H6, then this area would be removed from one of the other blocks. There will only ever be up to 400 private for sale homes in this scheme. A 'masterplan' is a design proposal for an area, not just one structure. It usually sets out the general principles around the new infrastructure, such as the buildings and their uses, the grounds around these buildings, and the public realm. A masterplan details how a series of objectives (such as providing new leisure facilities and a school in the case of Britannia) will be delivered as a set of designs that complement each other, rather than planning different elements separately which may not 'fit' together. A masterplan also considers the order in which buildings will be built (known as 'phasing') and the practical implications of construction (traffic, access, building site size, etc.). Phasing refers to the delivery of separate elements of our plans at different times. Our plans have been 'phased' to ensure that the existing leisure centre stays open until the new centre is up and running, and the new school building will be open by September 2021. The project has also been phased so that we can manage the delivery and construction more effectively and minimise the impact of the development process on the neighbourhood. When will the new leisure centre, school and affordable housing be ready? It's hoped that construction will start on the leisure centre and school in spring 2019 and complete 2021. The old leisure centre will not close until the new one is open. Construction of the 81 new homes for Council social rent and shared ownership is due to start in 2020. It's hoped they will be ready by summer 2022. When will the planning application for the second phase be submitted? A planning application detailing the second phase, which covers the four residential blocks comprising up to 388 homes for outright sale, should be submitted in 2020. If approved, work is expected to start in 2021. Was this the Council applying to itself for planning permission? No. It's the Council applying to the Local Planning Authority which sits within the Council but is independent of it. This is a regular and standard practice for any application that a council is making. The Local Planning Authority has a legal duty to consider an application from another Council department using all the rules, regulations, processes, etc., that it would for an application from an outside body. For significant developments like this, the application will be discussed and decided on by the Planning Committee, made up of elected councillors, at a public meeting where interested people and organisations can have their say. Viability assessments are independent reports used to help a developer assess the economic feasibility of a development. They take account of the costs of the development, e.g. acquiring the land, buying materials, construction and financing, and compare that to the development's estimated value once completed. Private developers will also usually factor in a desire to make a profit, generally about 20-25%. Viability assessments are also used by Planning Authorities to estimate the expected developer contributions associated with a development, such as affordable housing numbers or other planning obligations like Section 106 agreements, which help pay for associated infrastructure. What did the viability assessment of the Britannia project conclude? The Council commissioned an independent viability assessment from Savills. It found that, after the sale of the 400 homes, another £69.87m would be needed to cover the costs of the project. This aligns with the contribution range the Council expected as set out in the December 2017 Cabinet report. In order to be prudent, the Council requested the assessment assumed a cautious position and factor in a potential increase of 7.5% to cover potential rises in costs and/or a decline in house prices, similar to a contingency fund. As such, all associated figures are higher than the predicted costs based on current best estimates. The Council has calculated that the actual contribution it will need to make will be smaller than this, at about £41.8m. The difference between the contribution identified in the viability assessment and this figure is the 7.5% of additional project cost and residential sales risk added to the overall project cost (£384m including 7.5% cost/sales cover). The Council does not anticipate it will have to pay £69.87m. Is the Britannia Project financially viable? Usually, the commercial 'viability' of a scheme will be judged on whether the value when completed is greater than the costs of building it, and private developers will also usually factor in a desire for 20-25% profit on top. However, whether something is commercially 'viable' in planning terms does not measure whether it is worthwhile. With the Britannia project, the Council is acting as the developer and its priority is not to make a profit, but to find the most cost-effective way to deliver the much-needed new leisure centre, school, affordable housing and other public facilities. 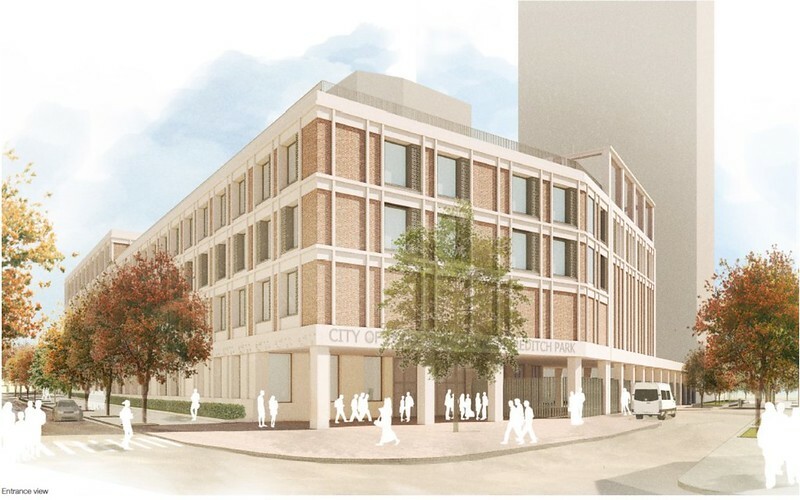 The Council views the £41.8m it expects to contribute as being worthwhile for the benefits the project will bring to Hackney residents. Is it a planning requirement to make viability assessments public, and will the Council be making this viability assessment public? The publication and transparency of viability assessments is on a case by case basis, and many factors are involved in the amount of information a developer will share. The Council published the report from its independent viability assessor when it submitted the Britannia site planning application because it wanted to share as much information as possible with the community. The Council was not in a position to issue the full viability assessment at the time of planning submission due to the commercially sensitive information contained in the appendices regarding the ongoing tender for the construction of the Phase 1 projects (school and leisure centre). Publishing at that time could have negatively impacted the Council’s ability to negotiate the best deal for taxpayers. However, this procurement is now more advanced and the Council has committed to fully disclose all appendices to the viability assessment in advance of the Planning Committee meeting. These will be issued, alongside other updated information, as part of a routine planning re-consultation exercise in July. This exercise will pull together any clarifications and updates which have been discussed with planners since the start of the planning period. The total cost of delivering the Britannia scheme is estimated at £384m in the viability assessment. This includes 7.5% the cost/sales cover, so it will hopefully be less. If costs remain as they are now, the viability assessment forecasts it would come in at about £360m, £24m less. Previously the Council said it would have to contribute £41.8m. Why does the viability assessment say £69.87m? The Council still anticipates it will have to contribute about £41.8m. The £69.87m is the projected contribution if you factor in the 7.5% cost/sales cover. The extra £28m is the difference between the total project cost with 7.5% added and cost without. The Council asked that the viability assessment incorporate this cover into its calculations to because it wants to take a prudent approach with public money. The Council's figures in this regard differ slightly from the viability assessment because the Council has used more informed calculations on elements relating to finance, inflation and affordable housing income, based on local circumstance and knowledge not considered by the more general approach of the viability assessment. Such discrepancies are not uncommon between developers and independent viability assessors. Could the Council use its contribution to build the leisure centre and school without needing to build any housing? No. The cost of delivering the leisure centre, school and associated new public realm is estimated at £131m (including 7.5% to cover project cost and residential sales risk). The Council is receiving a contribution of about £21.8m from the Education and Skills Funding Agency towards the new school, which still leaves £110m to pay. This is a complex project that, in addition to providing a new leisure centre, school and homes, will deliver high quality public space, and improved connections to and from the Park for those living in the new homes and the surrounding area. This space will include a new public square and entrance to the park, enhanced public realm around the park edges, and a tree planting to create a more biodiverse and green environment which can be enjoyed by all. At the request of local residents, the new leisure centre will also provide a publicly accessible café and toilets. How is the Council paying for its contribution? The contribution will be met through a range of sources including the Council's Community Infrastructure Levy (CIL) income and capital receipts. Capitals receipts include things like property sales and commercial income from sites. The Community Infrastructure Levy (CIL) is a planning charge, introduced by the Planning Act 2008, which developers contribute to help local authorities deliver infrastructure to support the development of their area. What if house prices fall? Would this have an impact on the viability of the project? This would depend on how far house prices fell. The viability is based on current day market prices and includes a 7.5% project cost and residential sales risk allowance to accommodate changes in market conditions and/or other costs. The Council will continue to monitor economic conditions, including house prices and the impact these may have as we progress the project. In a scenario where it assessed that a contribution over and above the £41.8m expected was required, depending on the amount, the Council would review how the additional amount was to be funded and/or the scope of the project. Of course, the market may also increase in the period of the project which would mean the Council may have to contribute less. Have you considered the impact of Brexit on things like construction costs? Yes. Our cost plans for the Phase 1 projects include inflation assumptions. This is standard practice and based on current economic estimates. In addition, we have allowed an additional 7.5% project cost and residential sales risk allowance to take account of unexpected changes in market conditions. Professional fees include all costs associated with the design, management and delivery of the project. These are estimates built up using industry benchmarks, and covers design team costs, project/development management, surveys, legal fees (excluding sales), planning and building regulation fees, contractor procurement, and third-party fees, e.g. engagement with utility providers. What are sales, marketing and legal costs? Sales and Marketing costs are based on an industry standard percentage of 3% of the private for sale value as recommended by our development advisor. This reflects all costs (including legal transactions) associated with selling new build private homes. The Council prides itself on providing high quality leisure facilities and schools for the residents of Hackney. Despite funding pressures, we believe in investing to keep delivering high quality for years to come. There is also huge housing demand in Hackney, and the Council is always looking at ways it can provide more genuinely affordable housing for people. The current Britannia Leisure Centre is becoming increasingly expensive to maintain, regularly needs patching up (the pool has had to be closed several times in last few years) and is outdated in many respects. The current number of available school places in Hackney is not enough to meet demand. The City of London Academy Shoreditch Park is already open on a temporary site and helping to provide the places we need. The proposed permanent building will create an excellent learning environment for its 1,140 pupils. Finding land to build new infrastructure like this is very difficult in an inner London borough. You have to think creatively. We believe the Britannia site provides a great opportunity to build these much-needed new facilities which will benefit Hackney. We don't get any funding from the Government to help pay for new leisure facilities or new social housing, and we haven't been given enough funding from the Government to pay for a new school of the quality we believe Hackney's children deserve. Nor does the Council have a huge pile of money to spend; we've had our core funding cut by £130m since 2010. To help pay for the new leisure centre, school and affordable housing we need to build some homes for outright sale. These 400 homes are what we think will be required to pay for enough of the costs that the Council can cover the rest. Acting as developer also ensures as much money as possible goes to benefiting the community without the desire for profit. Building new infrastructure like this always comes with challenges - it's a balancing act and it's difficult to please everyone. However, we don't believe in managing decline in Hackney, or sitting on our hands waiting for the perfect site or some unexpected cash windfall, we believe in being ambitious and taking action. Why couldn't you just renovate the existing leisure centre? The age of the existing Britannia Leisure Centre, and the level of investment required to bring it up to current standards, means that it is no longer cost-effective to operate and increasingly fails to meet the diverse needs of users. We know many people treasure the existing leisure centre and have fond memories of it. The new one won't be exactly the same, but it will have more and better quality facilities, meet modern standards approved by national sporting bodies, and be more accessible to people with disabilities. What are the specific issues with the existing leisure centre? Britannia Leisure Centre was built in two phases in the 1970s and 80s, with the dry side built first followed by the pool. This has resulted in multiple plant rooms and an inefficient building layout that is, unfortunately, not cost effective to operate. The mechanical and electrical systems need replacing and there are leaks from the health suite into the pool circulation area, and from the swimming pool tanks into the surrounding ground. The design and layout of the existing building also means that the facilities do not fully comply with current design guidance from Sport England and national governing bodies of sports' standards - particularly with regard to the swimming pools (the main swimming pool is what is known in the industry as a 'free form leisure pool' which is not conducive to swimming lessons, health and fitness swimming or swimming galas in a way that a rectangular 'tank' would be). How much would refurbishing the existing leisure centre to modern standards cost? Option one: the costs of bringing the leisure centre back into a reasonable state of repair was estimated to be £5.6m. However, the proposed works would only extend the life of the existing building, there would be further significant maintenance costs due to the age of the building over its life, and there would be no significant improvements to the building, i.e. the type and scale of the facilities would remain exactly the same. It should also be noted that more detailed surveys would be required, if this was the route the Council wanted to follow, and these more intrusive surveys would undoubtedly lead to the identification of further work and an escalation of the estimated remedial costs. Option two: to refurbish throughout would require the leisure centre to close for 18-24 months and ultimately would not create a modern, energy efficient facility that better reflects prevailing patterns and types of use, compared to that envisaged when the original facilities were built in the '70s and '80s. Will the existing leisure centre be closed before the new facilities are open? No. The existing leisure centre will remain open until the new one is completed and open. However, there will be no replacement tennis courts or football pitches during the construction of the new Centre. Will you replace the hard-standing courts when the new centre is built on that area? The Council aims to replace as much of the current hard standing multi-use games area as possible on the roof of the new leisure centre. Will there be any disruption to existing services or opening hours during any building works? The Council will seek to maintain all existing services and current hours throughout the building of the new leisure centre and the school. It may be necessary to access the existing leisure centre through a different entrance at some point, but if so this will be advertised in advance and signage put up to make the entrance arrangements clear. Will there be facilities in the leisure centre that park users can access? The Council is planning to include a café and toilets in the leisure centre that can be used by the public, without the need to go through the turnstiles that provide access to the centre's activity areas. Who will run the new centre, and will any jobs be lost? GLL will carry on running the centre. There is no reason why any members of GLL staff should lose their jobs. What will happen to the leisure centre's prices? The new Britannia Leisure Centre will continue to be operated by GLL, as part of the Council's existing leisure management contract. Fees and charges are set annually by the Council for all its leisure facilities and this will continue to be the case for the new Britannia Leisure Centre. Will the school have a joint use arrangement with the leisure centre? There have been no such discussions about a joint use agreement. It is the Council's aim to provide the school with sufficient facilities to prevent the need for it to use the leisure centre to provide core PE and sports provision. It will be able to book to use the leisure centre like any other school, but will not have any right to exclusive access. Will access be improved for people with disabilities? Yes, they will be much better. There will be better access ramps, automatic doors, lifts and hand rails, and both the wet and dry changing rooms are more disability friendly. 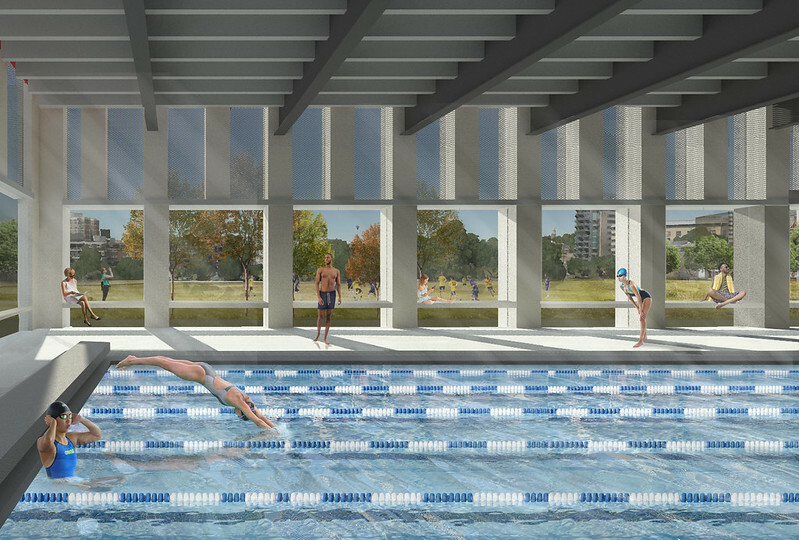 There will also be better facilities for pool access. Hearing aid induction loops will be provided within the building and the layout and colour scheme has been designed to support partially sighted people. The new, five-storey school, will be an academy as councils are no longer legally allowed to set up maintained community schools. It will provide places for 1,140 students aged from 11-18 years, including a sixth form of 200. There will be six classes in each year group. It will be called City of London Academy Shoreditch Park. It will use Hackney's existing admissions policy, based on distance from the school, and will not be selective. The school opened on a temporary site, in Audrey Street, Haggerston, in September 2017. It will move to its permanent site in the academic year 2021-22.
Who will run the new secondary school? The City of London Academy Trust will be the sponsor of the new school. This Trust already sponsors the very successful City Academy Hackney, so the Council has an existing, positive relationship with them. Why do you need a new school? Until very recently, population data indicated that Hackney needed 1,650 additional secondary school places by 2021 (the equivalent of two new schools to cater for 11 new forms of entry). The latest data suggests the increase in demand may not be quite as significant, though this needs further analysis (see next question). Whatever the precise increase in demand, the extra places cannot be accommodated within Hackney's existing schools. The first of the two schools will be City of London Academy Shoreditch. The second, also being run by City of London Academy Trust, is planned for the Benthal Primary School site in the Hackney Downs area. New data suggests Hackney many no longer need as many secondary school places as previously though, so do you still need the new school on the Britannia site? Yes. The previous data suggested we would need two new secondary schools by 2021 to cater for 11 new forms of entry. One of these is the City of London Academy Shoreditch Park, which is already open, full and oversubscribed, the other would be in Hackney Downs. The most recent set of data indicates a decrease in the pace of the growth in demand for secondary school places, so we have paused building the school at Hackney Downs to further analyse our own data and wait for additional information from the GLA. We want to find out whether this is a trend of just a blip. The demand for secondary places is a complex picture, based on many factors such as birth rates, people moving into and out of the borough and the number of children in our primary schools. There could be many reasons for this slow-down, and it would be remiss of us to push ahead with the second secondary at this time, until we have analysed the next set of demographic data. However, we definitely still need the extra school places that the Shoreditch Park Academy is providing - in total 940 for students aged 11-16 and 200 sixth form places. There is not a secondary school in this area and one year group is already being taught at a temporary site in Haggerston, ready to move to the school's permanent site. Building the school in Shoreditch is the quickest option and will provide local places where they are needed. The borough still requires additional places, but we need to assess when and in what number on a year by year basis, before deciding how to proceed with the second secondary school. Why did you open a school on a temporary site? To meet demand, Hackney needed the first of its new schools to be provided from September 2017. The permanent site for the City of London Academy Shoreditch Park was not ready so a temporary site was established to accommodate its pupils, until the permanent site at Britannia is completed. Why don't you just let a free school set up on site and allow the Government to fund the build? By retaining the Britannia site, which is Council-owned, we can ensure we build to the high standards our schools have come to expect and deserve. Hackney has an excellent track record in building award-winning, world-class schools through its Building Schools for the Future programme, and this school will be of the same high quality. By working with the City of London we can also ensure additional high quality education provision is created to benefit young people in the Borough. Why is the new school being built here? The concentration of pupils of school age across the borough does of course vary, and the availability of places in some areas is also supplemented by a higher density of non-maintained pupil places, particularly in the north. The Britannia site will provide the additional school places needed in the south of the borough. What are your plans for Shoreditch Park Primary School? The school will stay in its existing buildings on its existing site. The feasibility study did consider an option to replace it elsewhere on the site, but this would have meant a decrease in the size of the accommodation available to the school and a period of disruption. The existing school facilities are in good condition and offer a variety of spaces that the school makes full use of, but which would be difficult to replicate in a new building on what would have been a smaller footprint. The Council will work with the school to minimise disruption during construction on the site. The detailed construction programme will take account of the need to disrupt the school as little as practically possible. In total, there will be about 481 new homes built as part of the project, split across six different buildings. The current application proposes 81 Council homes for social rent and shared ownership, and 400 for outright sale. The affordable housing and the first 12 private units, be built in the first phase, will be in two blocks at the corner of Penn Street and Bridport Place (H1 and H2 in plans below). These will be 16 and 5 storeys high. Construction will hopefully start in 2019 and complete in 2021. The 'second phase' will include the remainder of the homes for outright sale, and comprise four blocks on the South-West of the site (H3 to H6). 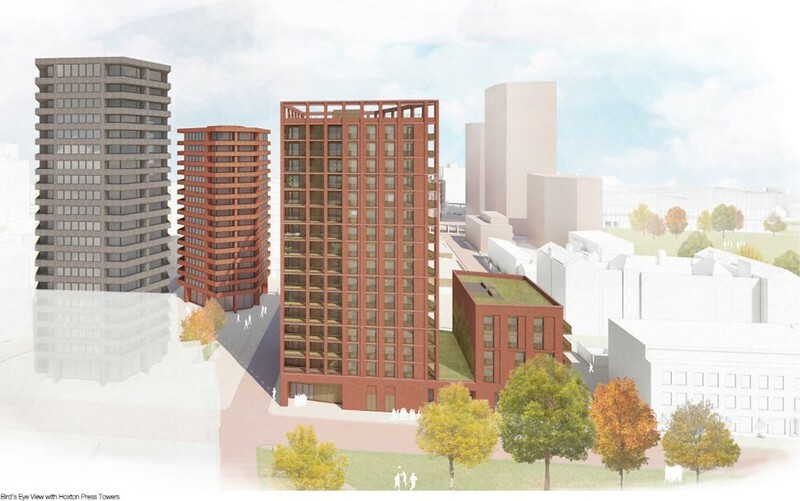 The illustrative scheme presented with this outline planning submission estimates the blocks will 4, 10, 25 and 19 storeys, but these details won't be confirmed until a later application. The homes are expected to be a mix of one, two and three bedrooms. Why is the Council building homes rather than a private developer? The Council is developing this scheme so it will retain the freehold of the land and be able to reinvest the funds raised by selling private homes to meet some of the costs of providing the new secondary school and leisure centre. No private developer would deliver this level of public investment and this many affordable homes from the proceeds of selling 400 private properties. For the scheme to break even, we would need to provide 560 homes for outright sale, but we have identified other funding that allows us to reduce the density of the housing needed. How did you decide how high the residential buildings would be and where they would go? The Council has considered the best way to deliver the homes as part of the overall masterplan from a number of perspectives, including townscape and context of nearby buildings, urban design, planning policy and environmental impacts, e.g. daylight/sunlight, wind etc. A complicating factor on this site is that it is crossed by four Crossrail 2 tunnels and a Thames Water storm relief sewer (see image in gallery). There are strict requirements setting out how buildings can be constructed over these tunnels. To ensure the Council maximises the amount of money spent above the ground, rather than on complex foundations, we have tried to avoid building tall buildings over these tunnels. This has been a significant consideration in the location and height of all buildings in the development. The Site Allocations Local Plan states the Britannia site would be suitable for up to 176 flats - how/why are you applying to build more? The reference in the Site Allocations Local Plan is to an earlier proposal that looked at how to replace the existing, ageing leisure centre with a new facility. That study estimated that 176 flats would need to be sold to fund that proposal, although it only related to replacing the leisure centre, not the larger scheme and site that we consulted on. The most recent feasibility study considered building both a new 1,100 place secondary school and a new leisure centre, against a background of increasing construction costs. This is why the number of units included in the options consulted on is more than that original number. How much will the flats be sold for? The Council has not fixed a price for the private homes. Estimates have been made of the potential sales values, using market intelligence. Given that any flats are unlikely to be sold for around three years, it is not possible to state a definitive price at this point, but the Council will continue to monitor property values in the immediate area, and through its subsequent development. Why are 81 of the 481 new homes being delivered as 'affordable', when Hackney's planning policy is that 50% of new builds should be 'affordable'? Fifty percent affordable is the default target on a development that is just housing. However, where a development includes other major elements of social infrastructure - in this instance a new leisure centre and school - the contribution to these is taken in to account in the planning application. As is often the case, it is a balancing act of trying to get the most public benefit with the money available. Why has starting work on the affordable homes been put back from its planned date of summer 2019? In December 2018, the Crossrail 2 team presented the Council with new proposals for the alignment of tunnels under Shoreditch Park. These would have meant the affordable homes could not be built as planned. Following discussions, a revised alignment has now been agreed which does not affect the new homes, but reaching this agreement has delayed the process of procuring a contractor, pushing back the housebuilding timeline. Under the original timeline the most disruptive works were due to take place on the Shoreditch Park Primary School playground during this year’s summer holidays. Now, they would have to start during the autumn term if that timeline was to be maintained, causing significant disruption to the school, so the decision has been taken to push the build programme back to 2020. There will be some works undertaken this summer along Gopsall Street, to prepare underground services to the new homes by digging a trench to lay pipework, which will affect the school site, but it is intended that this occurs as much as possible in the summer holiday period. How will the affordable homes be allocated? The new Council homes for social rent will be allocated to those most in need on the Council's housing waiting list. Everyone who joins the Council housing waiting list is assessed under our lettings policy and placed in a priority band. Those with the highest priority will be given the opportunity to move into the new homes. The new Council homes for shared ownership will be marketed to people living and working in Hackney first through the Council's in-house Hackney Sales team. For the first eight weeks, sales will only be allowed to Council or housing association tenants living in Hackney, followed by others living in Hackney, and then those working in Hackney. Only if there are still homes remaining will they be allocated to people outside of Hackney. With more housing being built, will local facilities become overcrowded? The Council will of course consider the impact on the local area in great detail in the master plan phase. This is an important part of planning applications, which include a section called the 'environmental impact assessment'. This will take into account the effects of the development on all aspects of the local environment, including the impact of the development as it is constructed and its impact once completed and functioning. It also looks at the development's use of natural resources, the potential emission of pollutants, and the elimination of waste. Will any trees be cut down? Yes, though new ones will be planted to replace them and overall there will be 35 more trees than there are now. Sixty-five existing trees will go, none of which are classed as Category A (the highest quality and value), and 100 new trees will be planted. It is expected that the new trees will meet and surpass the current tree canopy area within 10 years of planting. Tree species have been selected to improve air quality, shade and the local microclimate. What are the public realm / environmental improvements? What will you do to prevent building noise from affecting local people? This is an important part of any planning application and the Planning Committee will expect applicants to demonstrate that residents will not be negatively impacted, whether during construction or once the new development is operational. See further details on how noise issues are assessed as part of the planning process. What impact will the new housing have on parking in the area? This is a car-free development, so new residents will not be able to apply for a parking permit. As such there should be no additional pressure on neighbouring roads from new residents. Disabled parking will be provided as outlined in the planning submission. There will be 960 cycle parking spaces for residents and visitors, 206 for the school and 128 for the leisure centre. Will there be job opportunities for local people as a result of this development? The Council is looking at ways of ensuring that local people are given access to the employment opportunities that will arise from the development. This could include offering more apprenticeships than current legislation and policy dictates, requiring more jobs to be filled by those living locally, and providing training for young people to allow them to access skilled jobs in due course. What health and safety measures will be put in place to minimise the risk to the local community including pupils at Shoreditch Park Primary School and users of the Britannia Leisure Centre? The Council has considerable experience in this area. For example, when we built the new secondary and special schools including managing health and safety risks of a large construction programme. The builder will be required to be part of the Considerate Contractor's Scheme which requires them to consult with and respect the local community. An essential part of this scheme is to ensure the contractor puts the health and safety of the local population impacted by the project high on its list of priorities. How does Crossrail 2 fit into all this? The Council responded to the Crossrail 2 consultation and urged TFL to disregard proposals for a vent shaft anywhere on Shoreditch Park, asking they focus on the potential sites on eagle Wharf Road. The Mayor and Cabinet Member for Neighbourhood, Transport and Parks reiterated this view earlier this year in a letter to TFL. 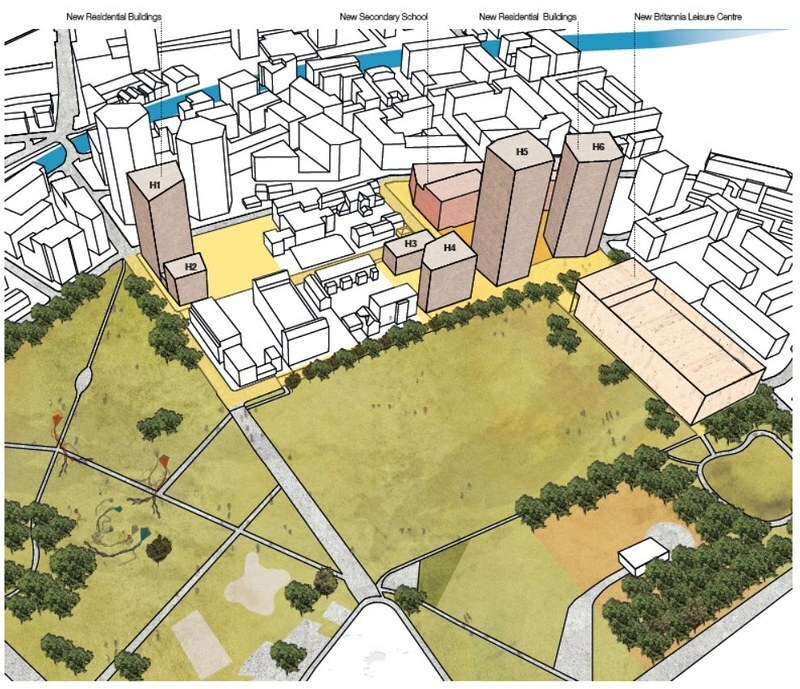 Is any area of Shoreditch Park included in the proposed new development? The only area of the park that we anticipate will be affected is the ball courts / tennis courts adjacent to Pitfield Street, which currently form part of Britannia Leisure Centre's facilities. These courts will be re-provided on the roof of the new leisure centre. Will you be building on park land? We do not anticipate that there will be any loss of green park space. Will any green space be lost? There is not expected to be any loss of green space on the park itself. It is currently envisaged that the trees on the edge of the existing leisure centre site will need to be removed to make way for the school building, but the Council will re-provide these with more trees than are currently on the site. Will the new secondary school be using Shoreditch Park to deliver lessons and after school activities? This may be the case on a temporary basis, when the school first opens but its own external areas are not fully finished. If it is, the Council will consider the impact on the park, particularly its grass areas, and what improvements would need to be made to address this. At this stage it is not known whether this will even be necessary. Will the buildings have an impact on views of the park? The leisure centre will be built on the Pitfield Street side of Shoreditch Park, on the existing ball courts. Although it will affect the view from the street into the park, from ground level these are already obscured by the fencing around the ball courts. The residential towers will be located to minimise the impact upon views of the Park from the respective boundaries. The secondary school will be built in the car park of the existing Leisure Centre, and will not therefore block views of the park, as the leisure centre already does so on that part of the site. In the coming weeks, residents in the vicinity of the Britannia Leisure Centre will receive a stator notification that the application has been submitted. Residents will be able to give their views on the application ahead of the Planning committee hearing the scheme. Following the statutory 21 day consultation, which closes on 10 April 2018, Hackney Planning Authority will review the application and set a date for the Planning Committee to review the scheme. A date for the hearing will be announced in due course. If the application is successful, works will start on site for Phase 1a, the Leisure Centre, in summer 2019 and will take around 18 months to build. This will quickly be followed by the school and then the affordable residential block on the corner of Penn Street and Bridport Place. We are proposing to start the private for sale homes in Phase 2, at a date to be confirmed. A full construction plan will submitted with the application and Hackney Council will work with the local community to ensure that residents are kept up to date on works on site. Here is a summary of that community engagement. When did the Council start looking at redeveloping the site? 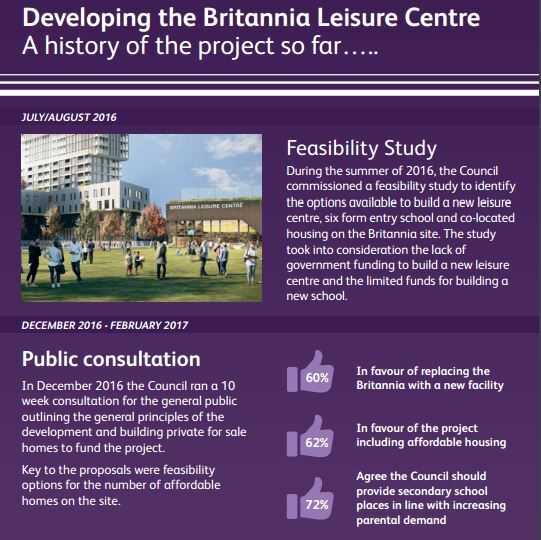 In summer 2016, Hackney Council conducted a feasibility study to look at options for the Britannia site, exploring whether it was possible to replace the outdated leisure centre with a new one, build a new secondary school, and provide private housing to pay for some of the cost of these community facilities, as well as some affordable homes, all on the Council-owned land on that site. It was followed by a 10-week consultation process on the proposed scheme and the feasible options, with the favoured option presented to Cabinet on 19 April 2017 when we were given approval to proceed. How have you engaged with the public? Since 2016, we have held over 30 different events for local residents, parents, Leisure Centre users and other interested groups about the proposals. These included the initial consultation, community workshops, feedback sessions, drop-ins for centre users and sports groups and the final planning exhibition. These have been held at the Colville Community Hall, Shoreditch Park Primary School and the Leisure Centre. The events, as well as general information on the project and how it's progressing, have been publicised in the Britannia Update [pdf, 571.27Kb] , a leaflet circulated to more than 30,000 properties in Hoxton, Shoreditch, De Beauvoir, Haggerston and London Fields. The most recent was sent out in February. In November and December 2017 we held a series of manned and unmanned pop-up information stalls at the Britannia Leisure Centre to showcase our progress on the proposals for the leisure element of the project. This was followed by a series of technical sessions with sports groups and other block bookers at the Centre to discuss their various sporting requirements at the new Facility. From 27 February until 3 March, we held a display boards from the planning exhibition [pdf, 3.54Mb] for the project at the Colville Community Hall and Britannia Leisure Centre. What were the community workshops? In July 2017 we ran a series of community workshops for local residents and groups. There were four events which focused on the masterplan, public realm, delivering new homes and a school and new leisure facilities which were attended by over 35 people. During these events, residents met and discussed the initial proposals for the site with the project architects and gave their feedback and ideas on a range of issues from design of the streetscape, facilities within the leisure centre and community amenities. The sessions for attendees to see how their input has informed the design of the project. What other information have you released on the project? The project team presented the scheme to a pre-application meeting on 13 February to discuss the proposals. This was the second pre-application meeting held with the planning committee and gave the project team an early opportunity to present the proposals for the final planning application to members of the planning committee. The process allows councillors to feed into the project at an early stage and raise any questions or concerns that can then be addressed by the project team. In order to submit a planning application, we compiled an environmental impact assessment (EIA) scoping report in November 2017, looking at the effects and environmental implications of the project, and enabling us to establish what further information we would need to assess the project. We published the report for the public to review in January 2018. The scoping report was also made available on Islington Council's planning portal as the project is close to the borough boundary. The final EIA report was submitted as a part of the planning application. Following a thorough tendering process we've appointed two award winning architecture teams and we're confident that they understand the aims, needs and sensitivities of the project. Feilden Clegg Bradley Studio will work on the masterplan for the whole site, including the housing, school and public open space. They are highly experienced in this field, having worked with Councils across London on high quality schemes, gaining national and international recognition for their community focused projects. They're pioneers in sustainable design, and their commitment to sustainability was one of the commitments which most impressed us. Faulkner Brown Architects will be designing the new state-of-the-art Britannia Leisure Centre. Their previous work includes the Lee Valley White Water Centre, the Derby Arena (a cycling velodrome and mixed use centre), Nottingham Ice Centre and numerous other world-class sports and leisure facilities.